I learned a new word today and am anxious to show it off and share it with the world. A FOLIVORE is an animal that eats leaves. With their high cellulose content and often raised levels of toxins drawn from the ground, mature leaves can be very difficult to digest so a folivore needs specialised equipment and adapted behaviour to be able to live off them. The subject came up as a result of an observation recently in Mote Park, near my home in Kent, UK. 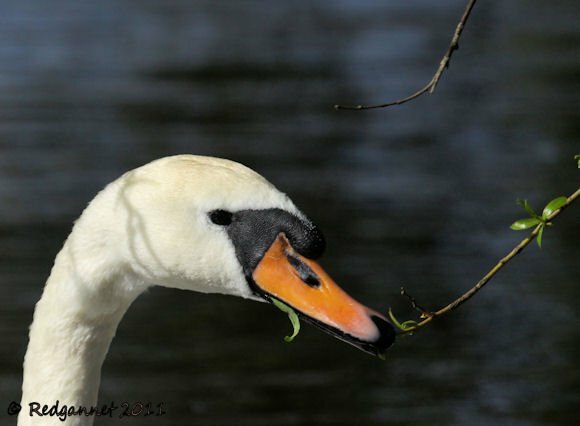 I saw a Mute Swan feeding on the fresh, new leaves of a Willow tree overhanging the lake. 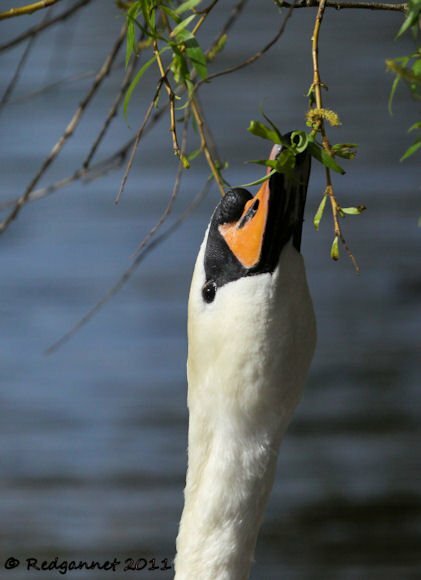 It repeatedly reached up into the low branches and stripped the pale green leaves to eat them. This was not a behaviour that I had seen before and I was sufficiently intrigued to take a few pictures. Tree leaves have a reputation for being hard to digest and animals, such as monkeys, that feed primarily on leaves, spend most of their time either eating or resting while their guts, with their specialised bacteria, break down the cellulose and extract the goodness from the meal. So I wondered why a swan would find good eating from tree leaves. The ingested leaves take a long time to break down and the extended innards needed to digest them would weigh heavy in a bird that relies on flight. As it happens, I thought this thought out loud in just the right place. I was walking with Simon who knows about such things. His initial thoughts were that the tannins and toxins would not have had a chance to build up in the leaves yet, making them easier to digest. 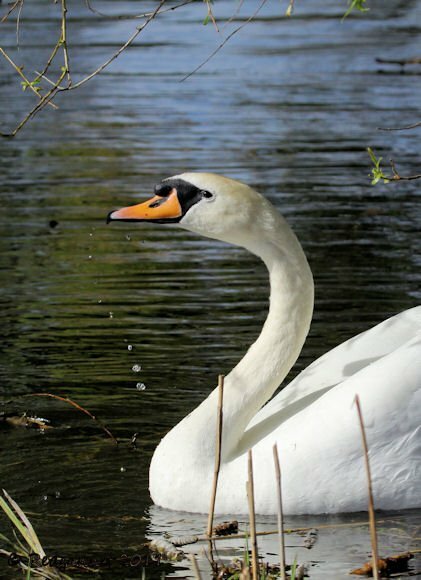 He later added that many folivorous animals show a preference for immature leaves and that the swans do not do much flying while they are nesting so the weight of composting leaves in their gut is of less importance. It would appear to be a popular source of food for the swans in Mote Park as many of the overhanging ornamental trees have had their lower branches stripped to within a swan’s neck-length from the water. I would assume that as the levels of tannin and toxins build up, the leaves will become less palatable to the swans and they will return to their usual diet of water plants. After each mouthful, the bird would dip its bill into the water to take a drink. It would be interesting to know if this is a local behaviour or whether it is more widespread. 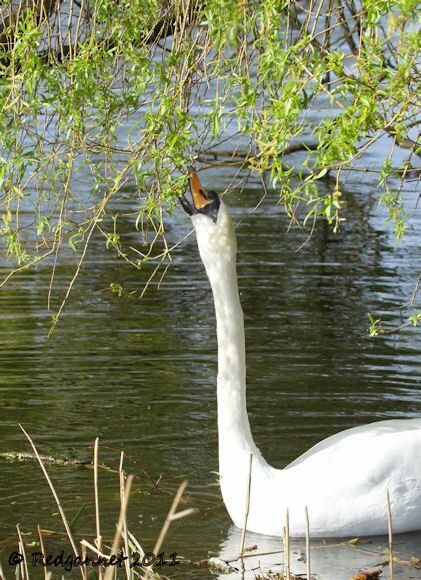 If you have any experience of swans, or any other birds for that matter, consuming tree leaves, please let us know. I would suspect that it may be a behaviour that is restricted to parks and gardens where ornamental trees overhang the water close enough for swans to reach. The Hoatzin, that counts the leaves from upwards of fifty trees on its menu, is the only example that we can come up with of a primarily folivorous flying bird. The Hoatzin has an enlarged crop where they ferment the leaves, but this displaces the keel and compromises their flight muscles reducing their aerobatic capacity. Thus they prefer to clamber through the trees rather than fly, but they still retain enough ability to be described as the world’s only flying compost heap. I’ve never seen this behavior but will keep an eye out for it now. And by eating salad do I become a folivore? Or is the term used exclusively for those that eat tree leaves? What is the National Bird of Latvia?